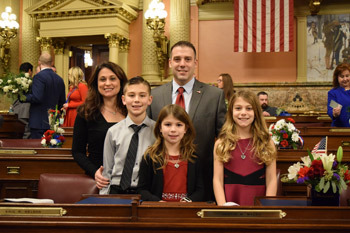 On Tuesday, the Pennsylvania House of Representatives convened so that the oath of office could be administered to House members. The House is now comprised of 110 Republicans and 91 Democrats, including 43 first-term members. There are two vacancies. Keep up with the latest news from the Capitol and the district at RepWalsh.com. You can also find out more as the session goes along on my Facebook page at Facebook.com/RepWalsh. In addition to all the delicious food offerings, the Farm Show features 6,000 animals, 10,000 competitive exhibits and 300 commercial exhibitors. If you’re participating in or attending the Farm Show, take your camera or phone along and snap some photos. You can share your memories and photos on my Facebook page at Facebook.com/RepWalsh. And when you’re posting the photos, don’t forget to insert the hashtag #PAFS19. More information is available at farmshow.pa.gov. Pennsylvania was previously one of four states that did not punish repeat DUIs as felonies. Act 153 fixes that by increasing penalties for repeated DUI crimes. Under the new law, any individual convicted of his or her third DUI with a BAC of 0.16 percent or higher could be found guilty of a felony offense. Additional initiatives to shore up the state’s fire and emergency response organizations were outlined in a recent report released under Senate Resolution 6 of 2017. The report includes 92 concepts incorporated into 27 recommendations to address challenges in the fire and EMS communities, with most of them focused on staffing, funding and training needs.